Inkjet printer reviews, information, ratings, evaluations prices to help decide which wide format inkjet printers and plotters such as Canon, Hewlett-Packard, Roland, Epson, Mutoh, Mimaki, as well as RIP software, color management and inkjet media. 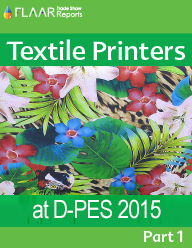 Textile printing with inkjet printers continues to be more popular around the world. 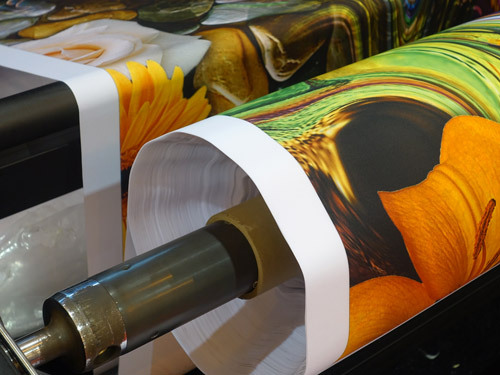 Ten years ago a basic retrofitted solvent printer, with entry-level printheads, were sold as “a textile printer.” But in recent years, print shop owners and managers have become more sophisticated and they prefer a better quality textile printer. So brand by brand the quality is improving. It is well known that acid dye ink and reactive dye ink produce impressive colors on the kinds of fabrics appropriate for each kind of ink. But it takes a football field of space to hold the pre-print and post-printing machines for washing, drying, fixing, etc. 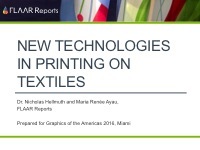 So more and more attention is focused on printing direct-to-fabric. Downside is that most pigment inks are not yet bright enough, and disperse dye ink direct-to-fabric was considered not as bright as printing on transfer paper, passing the paper through a calendering machine onto the polyester (but again, that requires a sophisticated calendering machine in addition to the printer (and lots of paper, including the second kind of paper to keep the image from being soaked from the sublimated colors). So it was a pleasant surprise for me to notice the impressive colors produced by the d-gen Teleios printer in the Media One booth, SGIA 2017. Bright yellow, colorful reds, great blues: and all colors better than I expected. I flew two sets of print samples back to the main office of FLAAR. Here you too can see the bright deep colors. Maria Renee Ayau and Dr Nicholas Hellmuth look forward to experiencing all the textile printer and textile ink experience of the d-gen team in Korea. We thank Kilhun Lee, CEO of d-gen for inviting us. We will have more posts on some innovative new textile printer technology of d-gen later this month (and for sure after we are in their factory headquarters demo room). 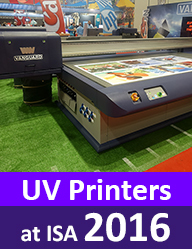 I smile when I see trade show PR blurbs claiming their expo is “the largest inkjet printer show.” Clearly they have not yet seen the last several years of growth of APPPEXPO in Shanghai: 100+ brands of UV-curing printers with over 200+ models. In fact the day before the expo opened the FLAAR team found over 126 booths with UV-cured printers. We estimate the number of models will be greater than last year. And textile printers, eco-solvent, and endless brands and technologies of cutters. With about 170+ booths of printable media and substrates, APPPEXPO 2017 is worth attending for that just by itself. Plus you can find dozens of brands of after-market ink. In fact APPPEXOO 2017 is so large that it takes six of us from FLAAR Reports to handle documenting all the signage and printer products and brands. Now that all of the major signage and printer expos are finished for 2016 we move forward on planning for 2017. The first expo of the year is SGI Dubai 2017, 15, 16, and 17 January 2017. Halls 3, 4, 5, 6, 7, and 8, Dubai World Trade Centre, UAE. This is the 20th Anniversary SGI Expo, organized by IEC, Falak Holdings. Actually Dubai is worth visiting for all its attractions. Dubai is close to beating Orlando for amusement parks. Indeed Dr Nicholas of FLAAR introduced to Dubai what is now the popular Dubai Garden Glow, which is within walking distance of the trade show convention center. www.SignMiddleEast.com provides more information from IEC, the Dubai show organizers. We have attended Sign Istanbul every year now for many years. This expo is large enough that it takes two from FLAAR Reports to handle taking notes, photographs, and checking on what are the trends. Normally we enjoy visiting the picturesque historical areas of Istanbul, but there was so much at the expo that we stayed at the Tuyap expo center all four days. In 2016, I attended six expos in a row during a 4 week period (46,000 miles of flights, 74,000 kilometers through three continents). Assistant Senaida Ba attended four of these with me. I asked her about her impressions of each expo: she said that at Sign Istanbul the people of Turkey were hospitable in the aisles and in the booths. In every country the booth personnel are helpful, but she said there was a welcoming manner in Turkey that was special. We look forward to seeing all the short-run digital presses and office printers which are missing from 80% of sign expos elsewhere in the world. Sign Istanbul had RICOH, RISO, OKI, Xerox, Konica Minolta, Develop (Turkish distributor of a major Japanese brand), and also HP Indigo. The other advantage of attending Sign Istanbul is the range of 3D printers; there was an entire area dedicated to 3D, of all sizes and diverse technologies. You could even find a MASSIVit 1800 at Sign Istanbul. There were more office printers at Sign Istanbul than every signage trade show in USA. There were more 3D printers at Sign Istanbul than every printer and sign expo in USA. Plus Sign Istanbul has textile printers, UV-curable, solvent, latex and water-based. Sign Istanbul is organized by Tarsus and the large team of iFO. FESPA Africa 2016, PRINT Africa 2016, 7-9 Sept.
We enjoy seeing a diverse range of all sizes and structures of UV-curing printers, so FESPA Africa is worth the journey to visit. If you come from outside this area, consider booking a safari to the internationally known national parks of southern Africa. I must admit I have never visited a national park here since I come by myself (no girlfriend with me to share the safari together). But there are many places in this part of the world you should consider enjoying, in addition to the expo. There were also several brands of office printers: desktop copiers and short-run digital presses. We did test printing on several. You can download our FLAAR Reports on toner printers. At the 2016 FESPA Africa we enjoyed giving an introductory lecture to the Printing SA at their Africa Print Conference. We would like to offer a comprehensive lecture/seminar program on textile printing for 2017, with Dr Nicholas and the textile printer workflow review editor Maria Renee Ayau. Also during FESPA Africa, Dr Nicholas was on a panel every day; the last two days with different printing experts from FESPA headquarters in the UK. A capable and experienced team in Johannesburg organizes all this. They are also editors of the two leading printing trade magazines in this part of the world: one magazine for wide-format inkjet and another magazine for toner printers and desktop inkjet. Fortunately SGIA in USA is Oct 10-12, so does not compete. 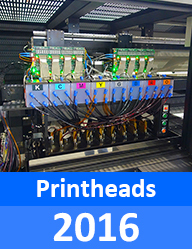 PRINT 17 (Graph Expo takes the name “PRINT” every four years) is Sept 25-28 (but we have skipped this in past years since there are not enough booths of printable materials, wide-format inks, etc. There is no Photokina, Glasstec, or Tecnargilla in 2017, so no conflict there either. This printer is competition for the newer Mimaki, d-gen, and D.G.I. This iti printer is not entry-level, so is not comparable to printers using Epson printheads. The iti textile printer uses more sophisticated print heads and is engineered for handling fabrics. Entry-level printers are solvent or water-based printers rebranded for handling transfer paper. Iti handles both transfer paper and actual fabrics. In mid-August Noel Mareno and Paul McGovern showed Dr Nicholas the new iti 3.2m textile printer. The most impressive aspect of the iti TX3200DS is the sophisticated fabric feeding and take-up system, plus a single sublimation ink which works both on transfer paper and on direct-to-fabric. Many people tell us that they watch to see which trade shows FLAAR attends, since they know we would not waste airfare and hotel expenses to go to a trade show unless it was worth attending. At least three of us will attend SGIA to see wide-format inkjet printing equipment and software. SGIA has cleverly focused on textile printing as a helpful way to attract more exhibitors and attendees. 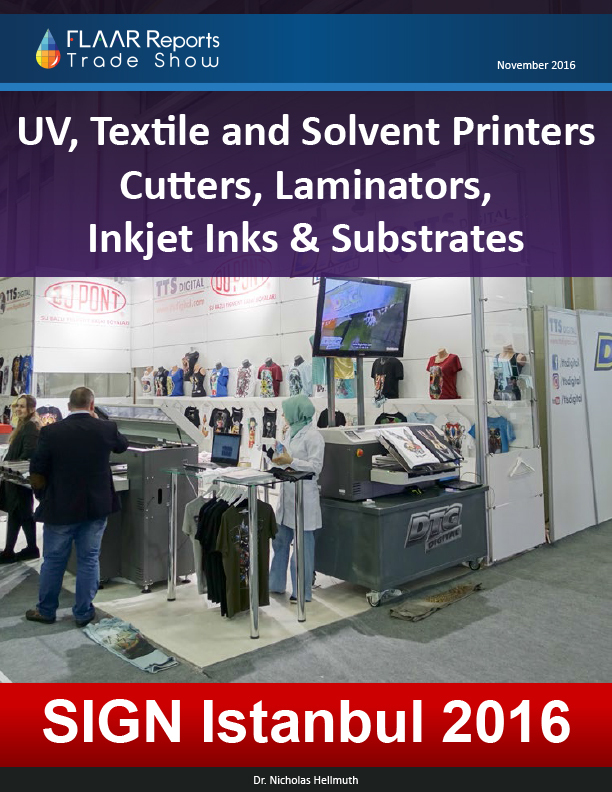 And of course UV-cured, solvent, latex, and water-based printers, inks, substrates and materials will also be on exhibit, along with cutters, RIP and color management software, and of course T-shirt printers. You can learn more from www.SGIA.org. Four of us attended ISA 2016 in Orlando. Plus we had a booth. Both were a good idea because there were thousands of people at the expo, especially the first two busy days. The free FLAAR Report will be posted this coming week. In addition we have many other FLAAR Reports in preparation for this summer. Which Printheads are in which brand of UV-cured printer. 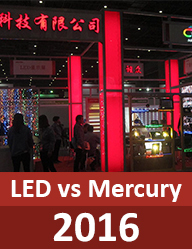 Which brands, which models, of UV-cured printers have LED or Mercury curing systems. 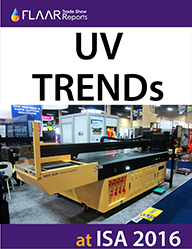 How many kinds of UV-cured printers were at ISA By brand, and by Model. Write [email protected] if you wish to order any of these special FLAAR Reports. There will also be comparable FLAAR Reports on printheads of UV-cured printers, and UV-printer TRENDs, etc. Here is the FLAAR team who work on printer and signage trends around the world. Since APPPEXPO 2016 (for printers, media, substrates, CNC routers, CO2 laser engravers and cutters) is larger than all European sign and printer expos put together, we sent five from FLAAR Reports to APPPEXPO 2016 in March. Expo was not big; was gigantic. Even though we worked ALL FOUR EXPO DAYS, plus also the pre-expo booth-set-up-day, we found so many printer, ink, media, cutter, laminator products that all five of us worked morning to night. If you missed APPPEXPO 2016, Dr Nicholas and the FLAAR Reports team hopes to see you at APPPEXPO 2017, in March. We also sent one evaluator to FESPA who reports it was a healthy venue. Four of us will be at ISA in a few weeks in Orlando (with a booth). Feel free to download our reports which include what you can expect from the then upcoming printer trade show in beautiful Shanghai. The actual 2016 reports are still in process. 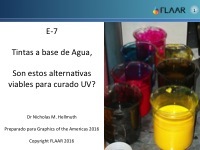 Dr Nicholas Hellmuth will be giving three lectures at GOA: two in Spanish and one in English. English lecture is on advances in all kinds of textile printers and printing. 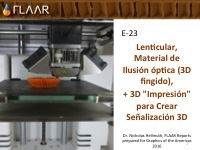 Spanish: one on everything related to 3D signage with printers. Second is on water-based inks (compared with solvent and UV). Two of us from FLAAR flew to Dubai to attend SGI (Sign Middle East), capably organized by IEC. This is the first international inkjet printer & signage trade show of the year, so worth attending. Lots of laminators, cutters, and printers or every size and shape for printing from tiny souvenirs to printing grand-format billboards and building wrap. 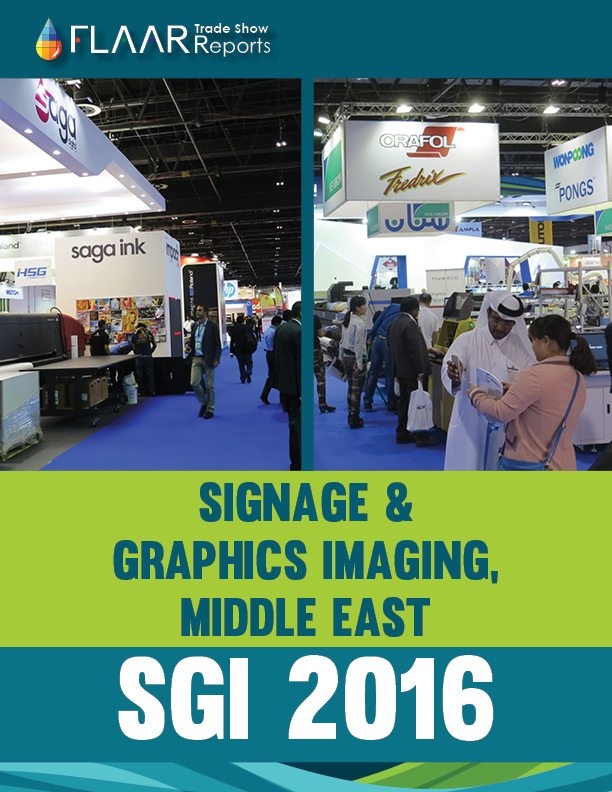 To learn more about SGI 2016, as a preview for 2017, (Sign & Graphic Imaging Middle East) their web site is www.SignMiddleEast.com. 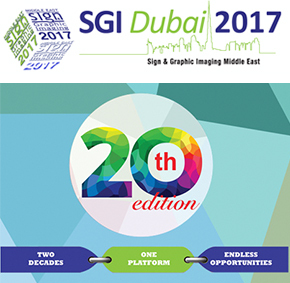 We hope to see you in Dubai in mid-January 2017, for the 20th SGI. PR releases for textile printers and textile inks, and even advertising claims on spec sheets, vary from dubious to doubtful. We point these out as constructive criticism, so that there is more fairness in advertising. Our goal is to assist distributors so that end-users (print shop owners and managers) can have more reliable spec sheets. “one ink for all types of fabrics” not likely, since all fabrics are different, hence react differently to the chemicals in each ink. One sole ink cannot possibly work on 100% of all the different types of materials for textile printing. “does not need pre-treatment” even pigment ink needs fabrics to be pre-treated so the pigment adheres to the fabric. You might not have to coat it yourself but you need the fabric to have a coating. It is very unlikely for inks to contain the sufficient amount of binder to do without pre-treatments, cause it would cause the printheads to clog. “just print, no finishing” while many inks do not require a complicated process comparable to acid or reactive inks, it does not mean they don’t at least need fixing, whether it is with a heat press or calender. Plus, realize that “no finishing” may mean you can show the example at a signage or textile or printer expo, but if you try to use this same print sample out in the real world it will either fade quickly or not survive washing or otherwise not be what an unfortunate end-user expected. “we are manufacturers…” Most companies claim they manufacture and sell their own printers, yet you can clearly tell by looking at their printer chassis that it is made by other well-known brands of printers in the industry. Okay, yes, there are some really big factories which produce several brands. And each brand can appropriately say they have their own factory (as long as they clearly identify the actual name of the factory, which is almost NEVER the name of the printer brand). The claim we are pointing out is when a printer (or calendering machine or laminator or cutter) is claimed to be produced by the brand itself, yet they clearly do not have their own factory at all. I would also point out the companies which may indeed have their own factory, but in reality they simply assemble standard parts. These same identical components are in a dozen other printer brands (but each brand has its own outside color and outside shape of the plastic covering for the printer. So even if a printer does have its own factory, what counts is do they know how to make their own firmware? Do they know how to improve the engineering of their printer’s features over competing brands? 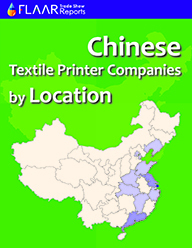 How many textile Printer brands are manufactured in China? 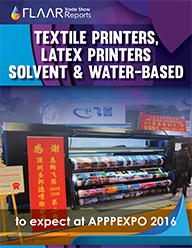 To save money you can of course do this list yourself: simply attend lots of textile expos in several cities in China. Do this for about two or three years. Calculate the costs in airfare, hotel, meals, plus time. And, if you do this by yourself, how do you know you have not missed several printers? We have harvested what we estimate are at least 95% of the brands (and at least 95% of the factory brands, since some brands are rebranded by distributors or partners). 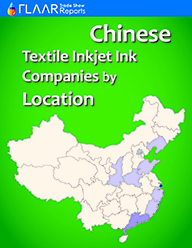 How many ink companies in China produce textile inks? How many textile printer brands are made in Korea, Japan, EU, and USA? This set starts with all the textile printers from ISA, FESPA (Europe), SGIA, and includes everything at ITMA 2015 (Milano, in mid-November). How many ink companies in Europe, Japan, Korea, Taiwan, and USA produce ink for textiles? How many dye sublimation brands are there in Western EU, USA, Korea, and Mainland China (both calendering units and dye sub for direct-to-fabric)? At full level (full Subscription for the coming twelve months) you can ask your questions by Skype, e-mail or telephone directly to Dr Nicholas and/or the textile printer & workflow evaluation manager at FLAAR, Maria Renee Ayau. In other words, consulting services for the coming 12 months. Plus: you can visit with the FLAAR team at any booth of ink, media and substrates at SGIA and ITMA in Italy. To learn about textile inks and textile printers, lots of new FLAAR Reports on SGIA and on ITMA in Milano will be available this coming month. Plus, if you wish consulting services on textile inks, on textile printers, on dye sublimation, or on wall coverings, make an appointment now to meet Dr Nicholas at either SGIA or ITMA (or both): e-mail FrontDesk “at” FLAAR.org.